FIRMLY IN CONTROL OF YOUR SERVICE ORGANIZATION. WHENEVER YOU WANT. WHEREVER YOU ARE. The heart of your organization. The level of service you provide is the single most important factor in today’s business. It determines whether customers will commit to a long term relationship and be a differentiating factor from the competition. That’s why we’re proud to introduce a revolutionary Service Management suite that enables you to work more efficiently and at reduced costs, whenever you want, wherever you are. It’s called Service Hub. 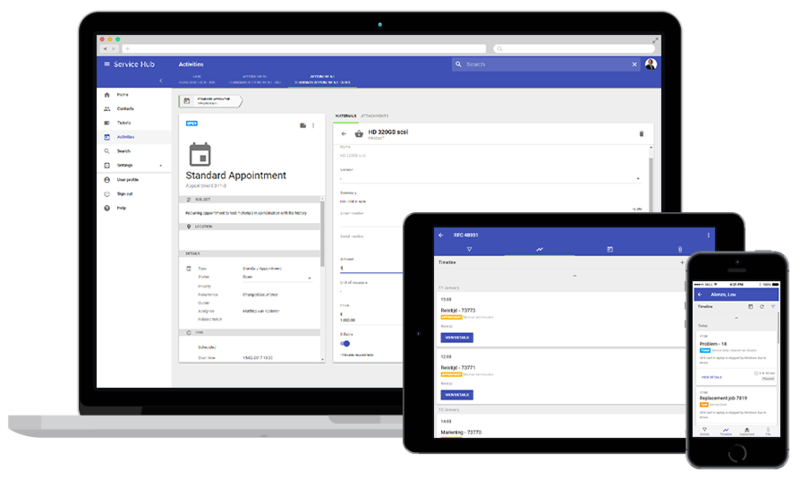 Service Hub gives you enhanced control over your daily tasks and empowers you to maintain an excellent service level for your organization, while providing extreme ease of use and a flexible, responsive design in a secure environment. Sign up for more info. DISCOVER THE NEW STANDARD IN SERVICE MANAGEMENT. Runs natively on laptops, tablets & phones. It doesn’t matter on which device you prefer to work. Service Hub is a fully cloud based solution. Just log in to your favorite browser on your favorite device and start getting work done. There are no lenghty installs, no mandatory updates and no additional downloads. Refreshing, isn’t it? Business applications like Service Hub need to be adjustable to meet your organisation’s processes, without the hassle of a customized environment. Therefore, Service Hub is quickly and easily configurable as per your needs. Plus, it can be used in tandem with Clientele ITSM, because both systems share the same database. That means you’ll always get to chose the solution that’s best suited for the tasks at hand. The design of Service Hub. Easy on the eye. Tough on security. View tickets with ease. Upload attachment in a moment’s notice. The simple, intuïtive user interface is based upon Google’s Material Design-language. Which means you’ll be instantly familiar with its controls, so you’ll get more done in less time. But when it comes to security, we didn’t cut any corners. Service Hub is built on a strong, robust foundation and designed with data security in mind. What’s more, Mproof, the company behind Service Hub, is completely ISO 27001 certified. 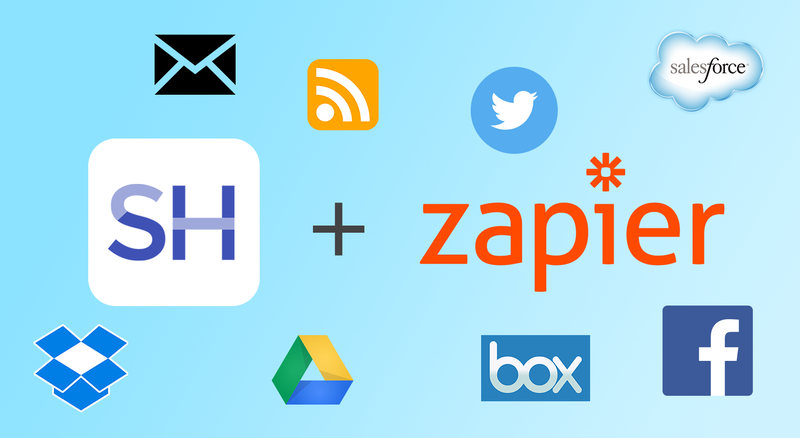 Thanks to its extensibilty, integration options and built-in support for services like Zapier, Service Hub is able to connect to a wide array of platforms. Connect with your favorite email client, storage solution, CRM software or financial platform. Exchange data on the fly. The possibilities are literally limitless. THE PERFECT ADDITION TO CLIENTELE ITSM. Publish frequently asked questions and common solutions. Identify common causes for problems within the organization. Manage all changes and releases from within your organization. Easily manage all the services you have on offer from within Service Hub. Measure the performance of your service organization and act accordingly. Connect with third parties using API’s or services like Zapier. Plan activities into calendars and keep tabs open on all employees. Monitor and keep track of all incidents, small and large. THE FUTURE OF SERVICE MANAGEMENT. With the built in search option, all the information you need is at your fingertips. As Service Hub uses the same database as Clientele ITSM, this function is perfect for engineers in the field. Service Hub is suitable for use on desktops, laptops, tablets and smartphones. Choose your device and browser and we’ll take care of the rest. Pretty neat! 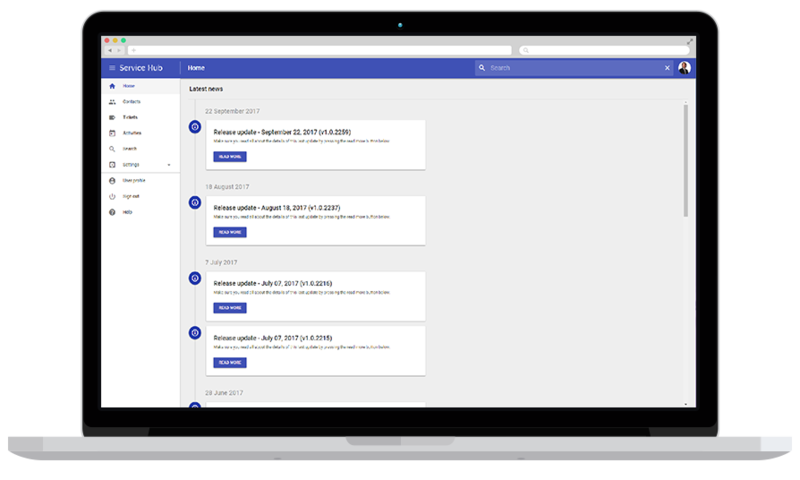 The powerful query builder will allow you to find very specific information, view the data anyway you want and save it for later use. Find and use your data exactly how you want it. Service Hub is built on a strong, robust foundation and designed with data security in mind. 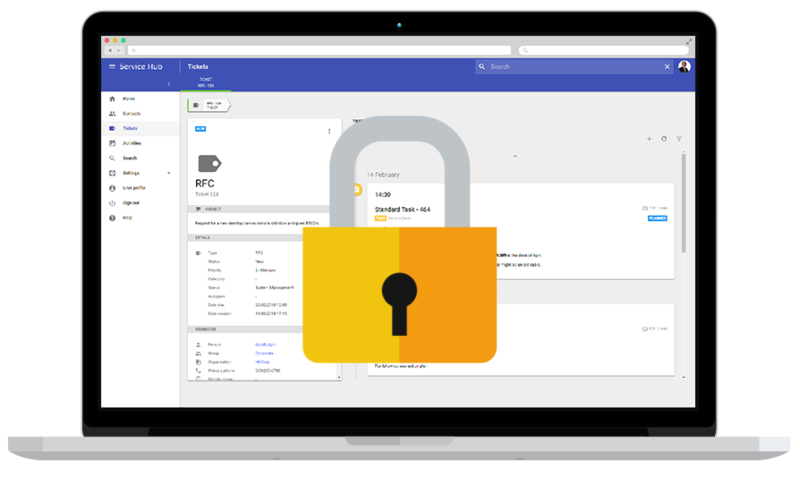 All data is encrypted and stored on Microsoft Azure servers to keep your data secure. THERE’S ALWAYS A PLAN THAT SUITS YOUR NEEDS. DO YOU HAVE OTHER INQUIRIES? CONTACT US. When will I be able to use Service Hub? Service Hub is now available for new and existing Clientele ITSM SaaS users. Is it necessary to be using Clientele ITSM SaaS? Service Hub is a full-scale cloud-application. That means that local installations are not required anymore. What’s more, managing your servers and clients is a thing of the past. All you need is a device, a browser and a working internet connection. Customers who require on-premise software and local data will have the option of a ‘hybrid’ solution, where Service Hub is used as cloud software, while Clientele ITSM and all your data stays on premise. This will benefit existing customers who’re using Clientele ITSM on premise and customers who’re not quite ready to take their data to the cloud. However, there will be additional costs involved using this hybrid solution. Will I be required to switch to Clientele ITSM SaaS when I want to use Service Hub? No. Although Service Hub is a new product that’s only available as a cloud solution, Clientele ITSM will remain available as both SaaS and On-Premise options. For users who want to keep using Clientele ITSM as on premise software, we offer a ‘hybrid’ solution (see previous question). In the meantime will continue to invest in Clientele ITSM as we’ve done for the past 20 years. Wat will Service Hub cost? Customers using Clientele ITSM as a cloud solution won’t pay a penny extra for using Service Hub. If you’re interested in using the hybrid solution that we offer, contact your account manager or partner manager for more information. Wat does Service Hub do in its current form? Service Hub v1.0 is meant as a replacement for our Clientele Mobile web application. Functionality is therefore limited currently. For example, it’s possible to change tickets and events, but creating new tickets and events is not available yet. You can use Clientele ITSM or the Self Service Portal for this. What is the roadmap for Service Hub? Since Service Hub is a cloud application, you’ll always end up using the latest version. In the coming months and years, new functionality will be constantly added over time. In the near future, look forward to support for third party applications, via REST API’s thanks to integrations with Zapier among others. This will allow you to integrate Facebook, Twitter, HubSpot and Google Drive among others with Service Hub and Clientele ITSM. START OPTIMIZING YOUR SERVICE ORGANIZATION. SERVICE HUB IS AVAILABLE NOW. Get Service Hub free of charge. Service Hub is now available free of charge to all Mproof customers running Clientele ITSM as Software as a Service. The two platforms work together in harmony to help you achieve the challenges your service organization is facing. MADE WITH ♥ IN THE NETHERLANDS. SERVICE HUB IS BEING BUILT BY THE PEOPLE BEHIND MPROOF.